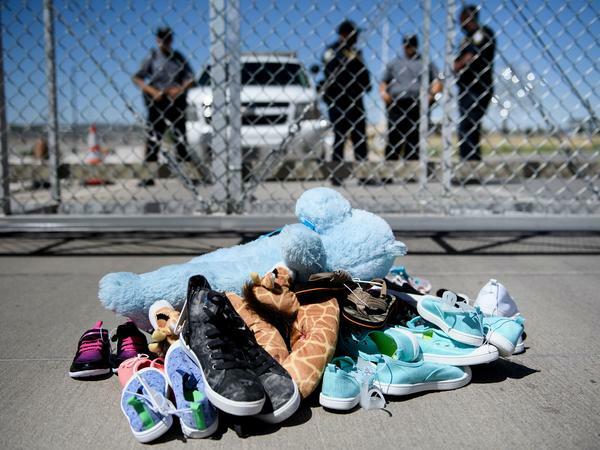 A Texas Sheriff prohibited his deputies from off-duty work at the newly constructed child-holding facility at the Tornillo Port of Entry where minors crossing the border without proper papers have been housed after being separated from adults. "The Sheriff's Office will not be working at these facilities, as we don't support the current administration's position of separating children simply to discourage illegal immigration," he told Texas Monthly. "Clearly, the outcry from the community would affect our ability to maintain the confidence and respect between the community we serve," Wiles told the El Paso Times. "It would impact our community policing efforts that we worked so many years to build." Wiles, an outspoken Democrat who opposed the Trump administration's now reversed policy, had permitted deputies to moonlight last week at the Tornillo facility, about 30 miles east of downtown El Paso, as it was being built. But they were only guarding equipment at the time, he explained. He only rescinded the job contract after learning that up to 360 undocumented immigrant children would be moving in. Wiles said he got a call on Friday alerting him that "it would house kids being separated from their parents being prosecuted for immigration violations. I said, 'Absolutely not!'" Off-duty law enforcement often take on private security jobs, but usually are required to get approval from their superiors. El Paso deputies previously have accepted jobs at a child-holding facility run by the same company that is now operating the newest encampment, Wiles admitted, but he said the circumstances had been different. At the time the temporary structures only housed unaccompanied minors who had made the treacherous journey across the border on their own. They tend to be older teenagers, usually 16 or 17 years old. The public condemnation by Wiles reflects a growing movement by local law enforcement and local government officials across the state who have denounced the administration's "zero tolerance" immigration policy. Earlier this week Houston police chief Art Acevedo railed against it over Twitter writing, "Have you spoken out? If you support this U.N.-American, un-Godly and inhumane policy, don't try to convince those that don't, save your rationale for God who is watching. WWJD?" A delegation of 16 U.S. mayors travelled across the country to the Tornillo facility on Thursday morning, calling for the immediate reunification of separated families. After weeks of mounting protests, public fury and dissent within his own party, President Trump signed an executive order on Wednesday putting an end to controversial family separation the policy. It mandates that rather than breaking families apart, they be placed in detention together — though the Trump administration will need legal changes to do that for more than 20 days. More than 2,300 children have been stripped from their parents and placed in tent camps and other facilities since the separation policy went into effect May 5.